After the Battle of Thermopylae, Athens was in despair. The Athenians knew that their city would surely be destroyed by the Persians. There was simply no place between the Persians and Athens where the Greeks dared to risk battle. Most of the Athenians fled to the island of Salamis where they watched their city burn and placed their trust in the fleet. 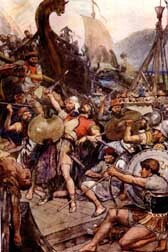 Knowing that winter would soon be arriving, Xerxes decided on a naval assault on the remaining Athenians and their naval forces stationed at Salamis. 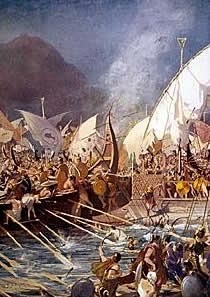 This great naval battle was fought between the Greeks and Persians in 480 BC in the narrow straight between Salamis and Attica. 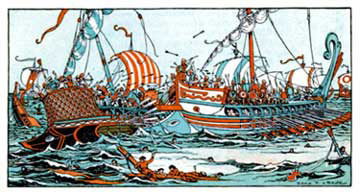 The Persian fleet was lessened somewhat because of a storm but it was still a vastly larger force than the Greeks. 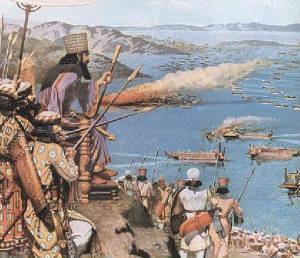 The Persians had around seven hundred ships, the Greeks around three hundred. 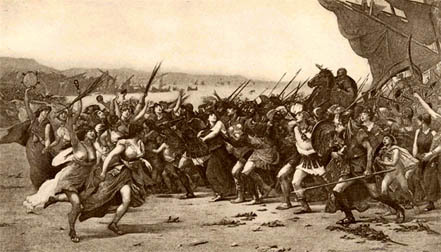 The Spartans and other allies were encamped in the Isthmus of Corinth, awaiting the outcome of the sea battle. Xerxes was sure of victory. 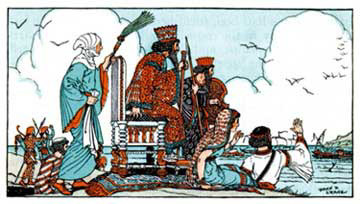 He had his throne placed on a hill overlooking the sea, in part to savor his victory and in part so his commanders would know that their king was watching them. The Greek forces were led by Themistocles, an Athenian statesman, who was responsible for devising the strategy used during the battle. However, he was not the general who carried out the plan; this was done by Eurybiades, a Spartan commander. Many of the captains of ships of Athen's allies were threatening to sail away to protect their own city states. They feared that the much larger Persian fleet would destroy them. Themistocles used a ruse to prevent them from fleeing. He sent a spy to the Persians telling them that they should come at once and block the pass so the Greeks could not escape. The Persians took the bait and sailed into the harbor. There was nothing to do now for the Greek navy but to fight! 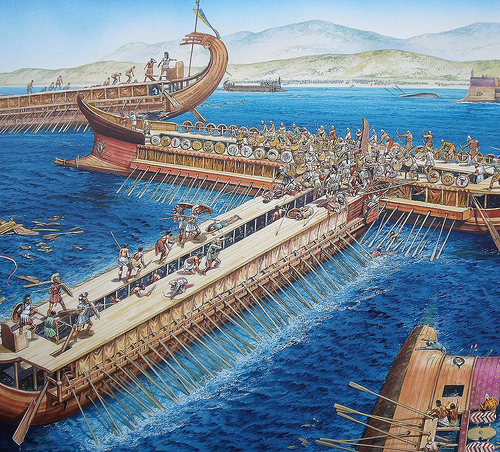 The lighter Greek ships rowed out in a circular fashion and rammed the front of their ships into the Persian vessel . 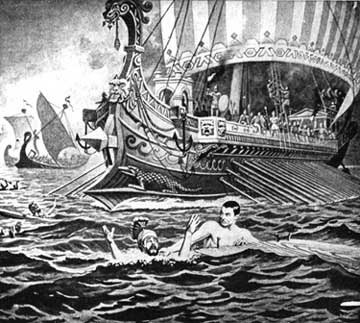 The narrow straight, the speed and maneuverability of the Greek ships and their knowledge of the waters enabled them to sink two hundred Persian ships. Some were captured and the rest fled back to their bases in Asia Minor. King Xerxes, upon seeing this great defeat at Salamis, headed back to Persia with what was left of his navy and part of his army. Xerxes was not done with Greece. He left behind a sizable force under the command of the Persian general Mardonius. These troops would be involved in the final of the Persian Wars, the Battle of Plataea.